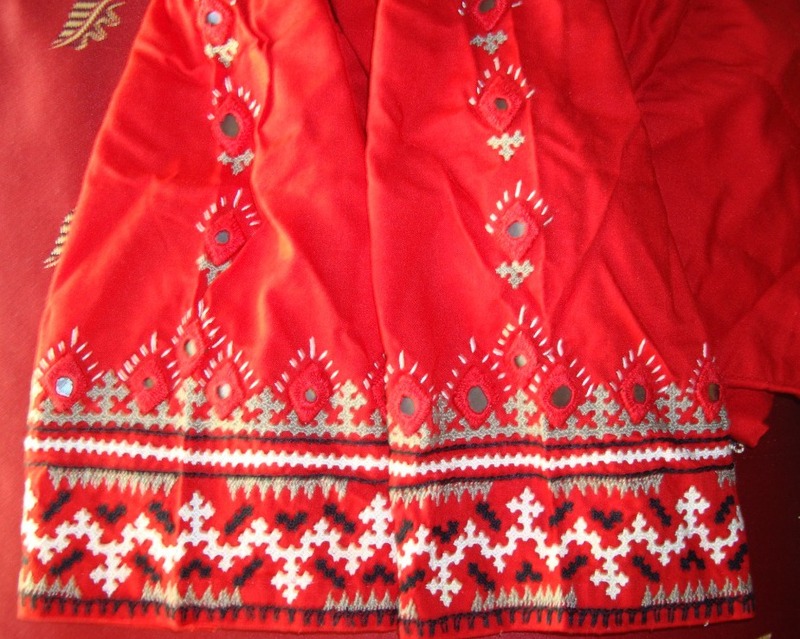 I had a half-white synthetic saree, with geometrical prints in black& red. 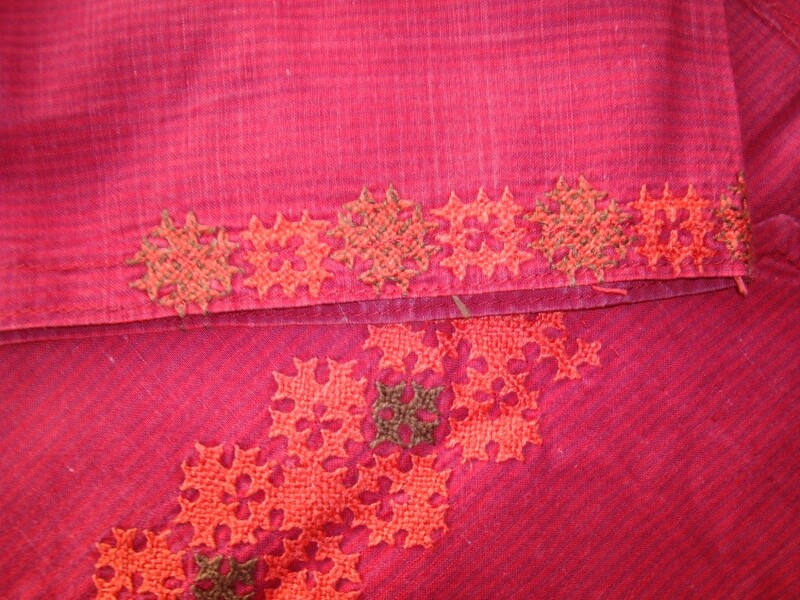 A red fabric was chosen as blouse to match the saree. 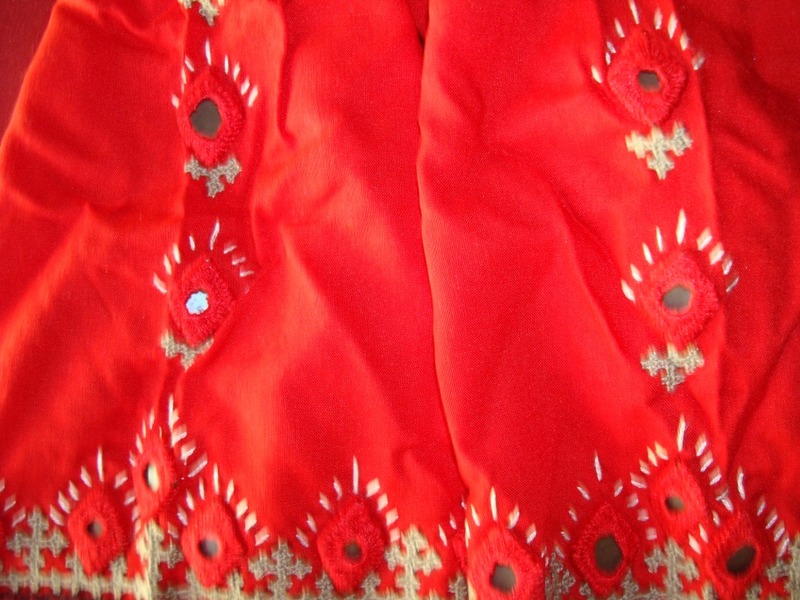 The whole embroidery was done only on the sleeves of the blouse. 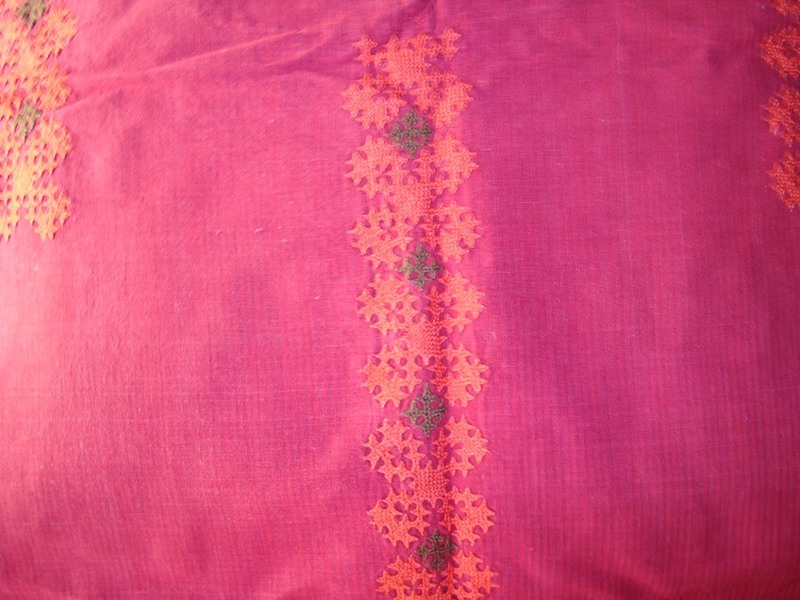 earlier, I just modified and customized the usual kutchwork patterns to my requirements. I used black, grayish green, and white colour threads to embroider the pattern. The mirrors were done in red . 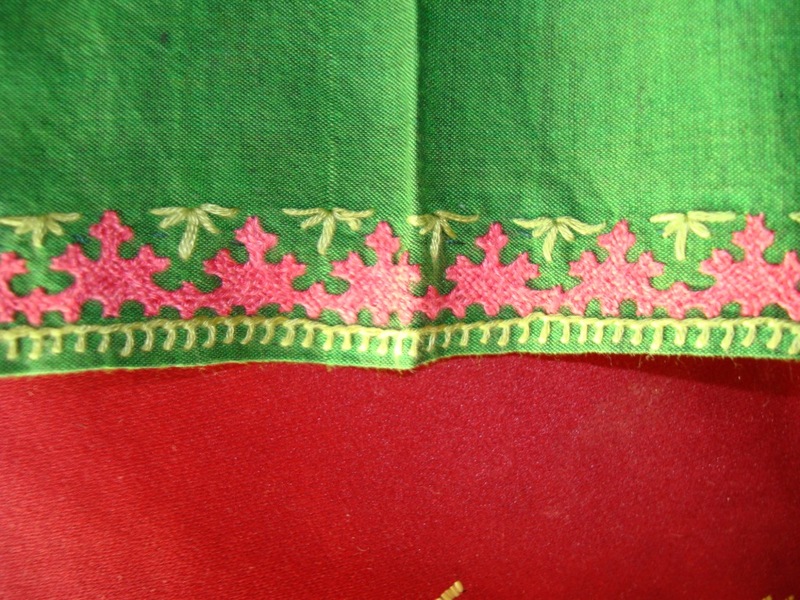 two variations of feather stitch, and some straight stitches around the mirror were used. 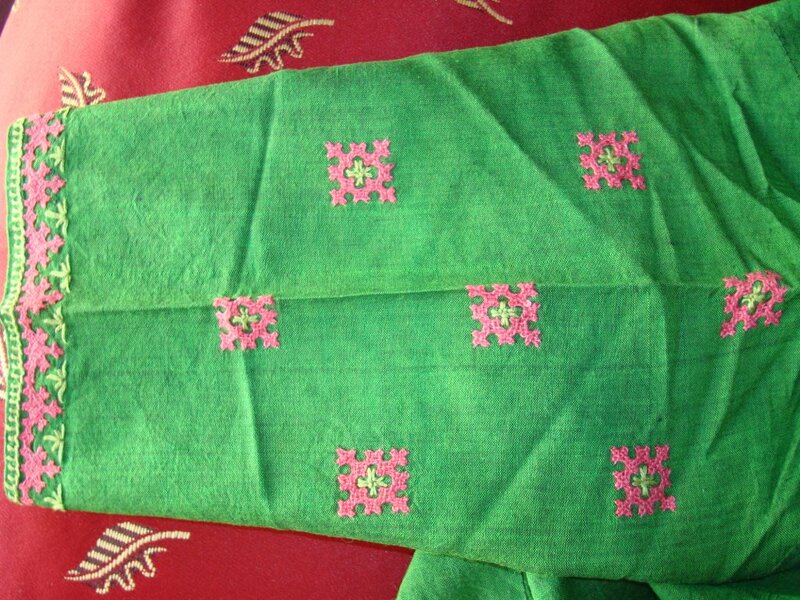 The saree is not with me anymore, but the blouse is still worn along with some other sarees. Because of the three colour combination- red , black& white. I drew kutchwork patterns on graph and tried working the journey for these new patterns. Instead of doing them a sampler, I embroidered on tunics. 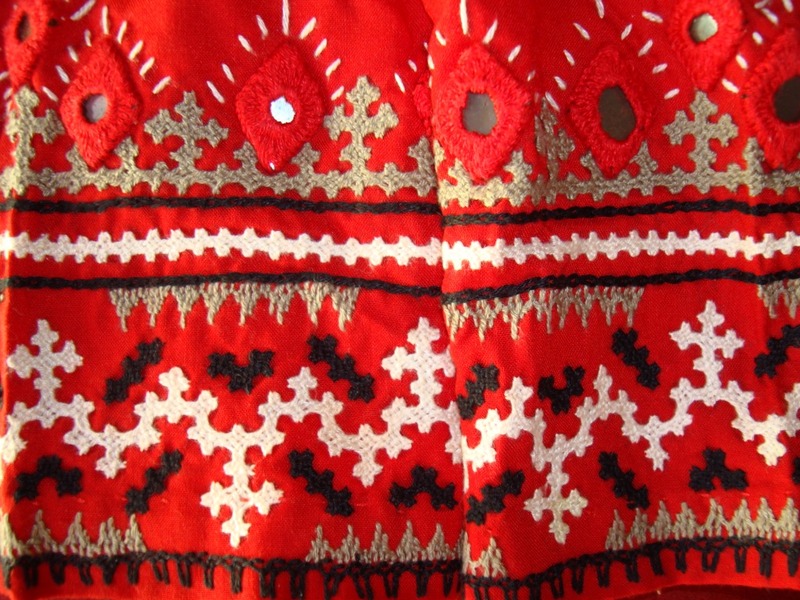 In this tunic, I chose one motif and repeated to form a border. 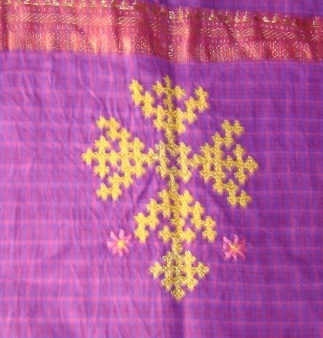 This border was worked in the middle and sides on the front side of the tunic. 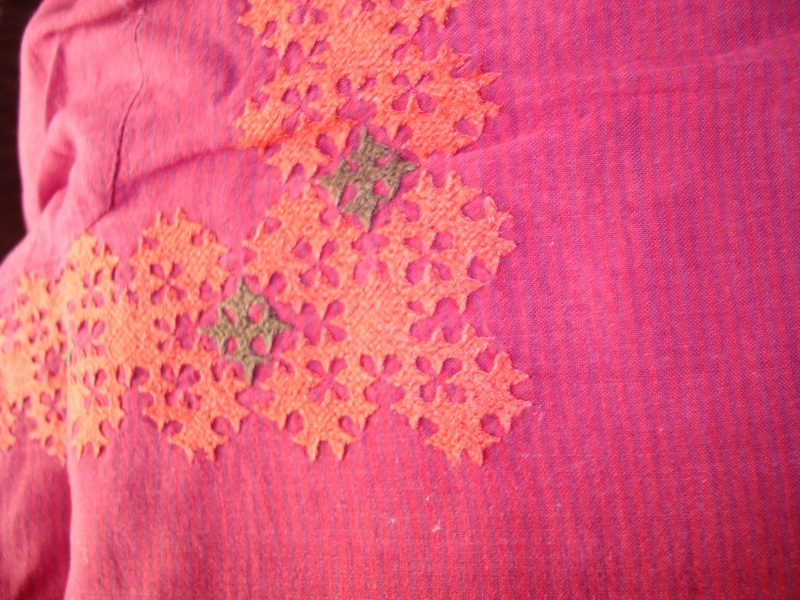 I knew , kutchwork in black thread is done on black fabric, making it look as a part of the fabric, like lace. Here, I wanted to try using medium red on maroon striped tunic. 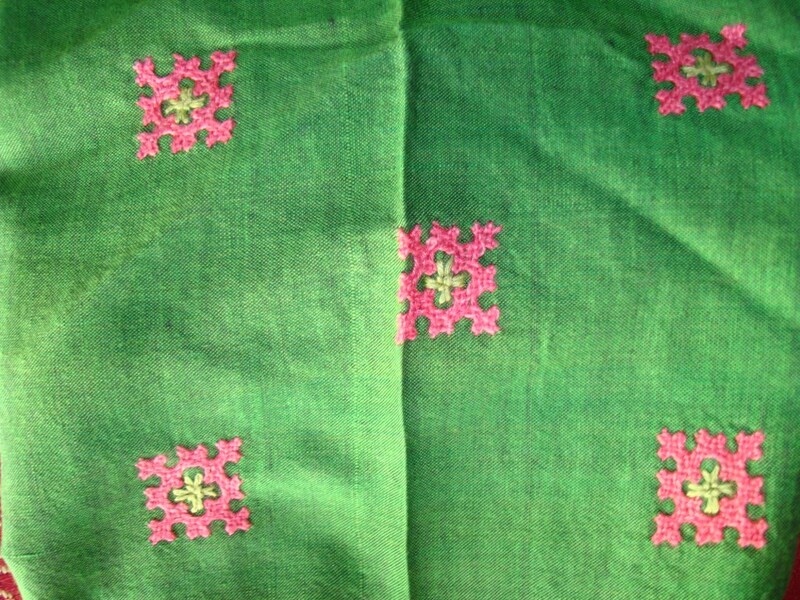 After completing the embroidery, I gave the fabric for sewing. This time all the pictures came got glued together, I had to insert again! Today, I don’t have time to play cat and mouse game with inserting pictures.Laksmi had given a suggestion, but I also need a guide.LOL! The time is not wasted , Iam drawing a pattern for a yoke.It sure does take time. 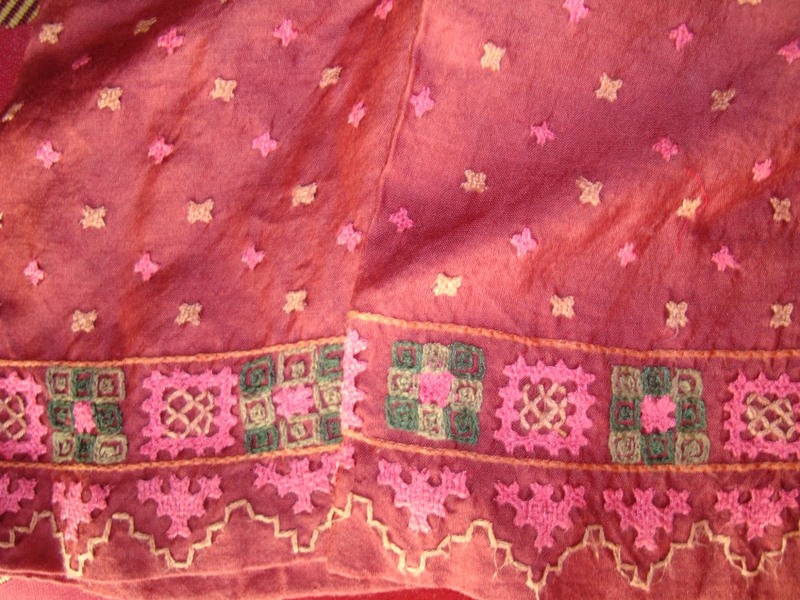 It is a kutchwork pattern, After seeing my previous projects, I was tempted to draw another kutchwork pattern. For some reason, for the past two days,.I am unable to insert the picture at the proper place on my posts.I don’t know what to do,Iam spending so much time on each posts. Till I figure what to do, bear with me. 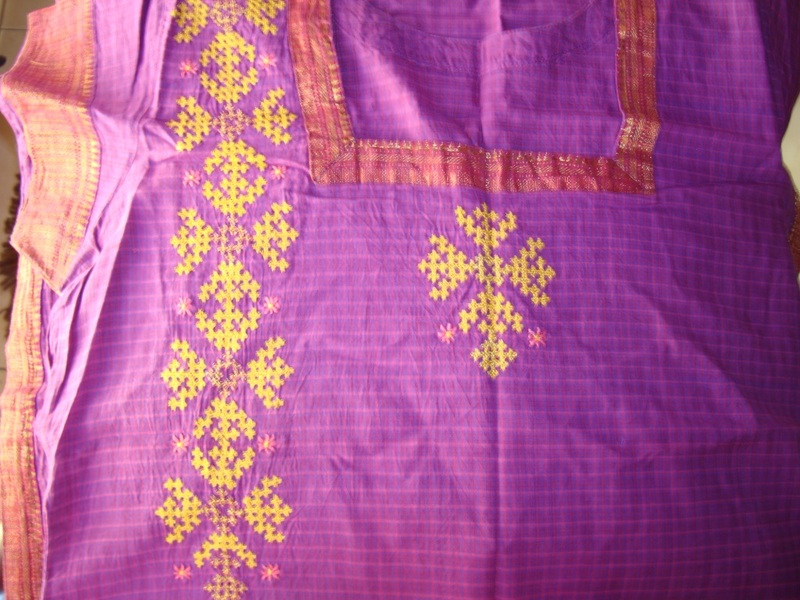 This tunic is double colour, dark pink and violet. The fabric is south cotton with checks and zari border. Thought, bright golden yellow thread will go well with the combination ,and I added a zari thread while going around the basic stitches. 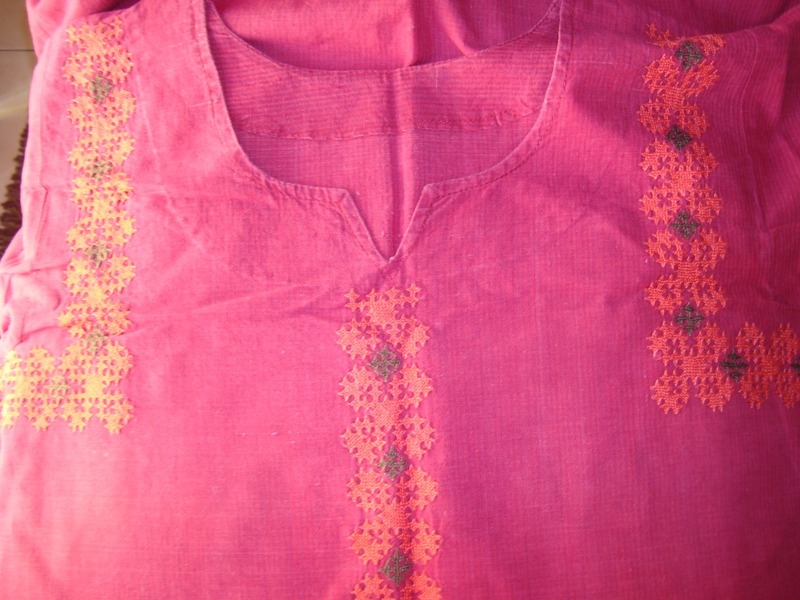 A motif pattern is repeated to form a border on the right side of the tunic , the same motif[extended a little] is used for the centre . I wore a tissue dupaata[scarf] for this tunic.